For a self-confessed late convert to the undisputed ethos of country music, Ags Connolly has totally nailed the authentic sound while investing heavily in his long time song writing qualities. A performer described as the ‘hard man of English country music’ he will take no prisoners when defending the preservation nature of his craft. Following the career of Ags since the release of his debut album back in 2014 reveals a path littered with many obstacles, but with the new album adding more weaponry to the fight, the future may just be a touch clearer. Make no mistake NOTHIN’ UNEXPECTED is no halfway meeting point and challenges prejudice head on with the heady status of its contents. What you get is ten classically sounding cuts – nine originals and a nod to one of his non-country song writing heroes Louden Wainwright III with a version of ‘I Suppose’. It’s a case of the old and the new for Ags with this record. He once again worked closely with his long standing colleague Dean Owens in the production role and teamed up with the players who helped him on the previous record HOW ABOUT NOW. The first new element is the route to market with a link up with At The Helm Records – a growing South Coast music operation intent on making the good stuff more accessible in the UK in the face of dumbed down populism. Secondly on a couple tracks Ags takes his Texas influence to another level with the added accordion of The Mavericks’ Michael Guerra taking the sound very close to the state’s southern border. ‘Do You Realise That Now’, ‘Nothin’ Unexpected’ and ‘Haunts Like This’ represent this portion of the album. 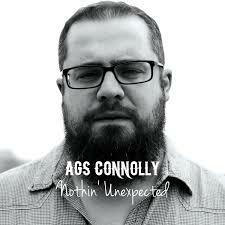 What makes this album work is the depth of sincerity and vocal feeling that Ags injects into his songs. This is clearly a man on a mission and the path to engagement is so much easier when you can hook into the ideals of the artist. The themes generally follow the country text book and what is objectionable about a timeless formula whose mantle would be taken up by someone else should Ags not have his stab at carrying the torch. ‘When the Loner Gets Lonely’ emerges as one of the album’s smartest songs and pushes for the top spot in light of stern competition from opening track and anointed promotional number ‘I Hope You’re Unhappy’. If the first song sets the standard, then the downbeat closer ‘I Should’ve Closed the Book’ brings proceedings to a wonderful melancholic ending. This shows that Ags and just an acoustic guitar plus a fine song can match the primary effect that the full band brings to the other parts of the album. Proudly independent and staunchly authentic, Ags Connolly will continue to be a pro-active artist on the UK music scene and is integral to the fight to make this brand of country music a welcome invitee in venues, events and movements across the whole land. Maybe NOTHIN’ UNEXPECTED can become a flag bearer for UK Ameripolitan. Well we do have UK Americana! Either way the new album is worth an investment as it plays an important role in preserving a style heavily influential to more modern brands. Oh and it’s rather good as well!